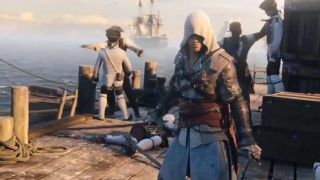 While games publisher Ubisoft continue to spruik new DLC for the Assassin's Creed 3, the interwebs has moved on, with a leaked trailer for the fourth major entry in the series showing up online. First uploaded (and then taken down) by GamesRadar, the trailer is still floating around Youtube, and introduces us to the protagonist of this new game; a piarate assassin named Edward Kenway. Breaking the mold of the game series so far, Kenway comes across as a bit of a rogue in this trailer, with a glimpse in the middle of the video of two naked women in his bed, and a sequence at the end where he kills an aristocratic-looking man, before taking the arm of the woman his victim was walking with. Beyond debauchery, the trailer does give a few more hints as to what we can expect in the upcoming swashbuckler, with infamous pirate Blackbeard narrating, a hectic battle aboard a galleon the centerpiece, and loads of treasure on display. Plus, rich dudes to kill, of course. We also discover the games October 29 release date and the fact that Ubisoft is planning a release of the game on "Next Gen consoles". Below is an embedded link to a video which is active on Youtube at the time of writing, but which could disappear with notice depending on the vigillance of Ubisoft.